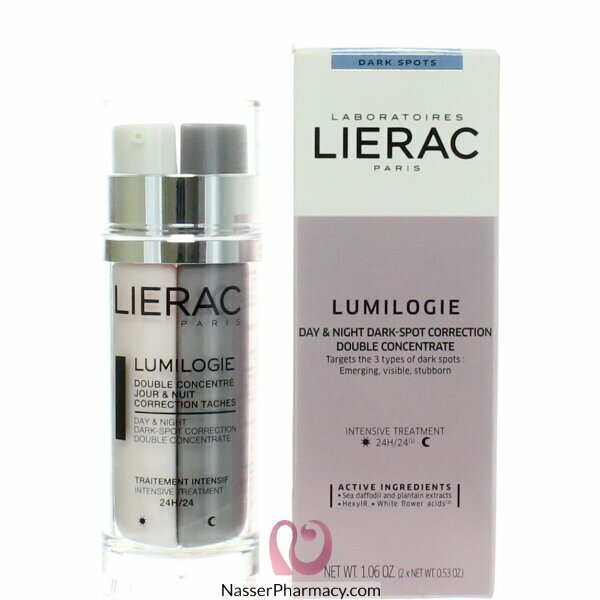 Lierac Lumilogie Day & Night Dark-Spot Correction Double Concentrate 30ml is a double concentrate that helps correct emerging spots, visible spots, dark spots. Its formula works thanks to several active ingredients from the best of science and nature. The day formula contains a concentrate of 2 vitamins (E and B3) with antioxidant and brightening properties. The night formula contains a concentrate of 7 hydroxy acids (glycolic, salicylic, lactic, pyruvic of white flowers, citric, malic and tartaric). It allows to over-activate the cell renewal to remove melanin at the surface. Results: emerging spots, visible spots, stubborn spots are much less visible. The complexion is radiant, even and bright. The skin is lightly perfumed with white flowers notes. In the morning, apply the day concentrate on the whole face, alone or under your daily care. In the evening, apply the night concentrate on the whole face, alone or under your daily care.